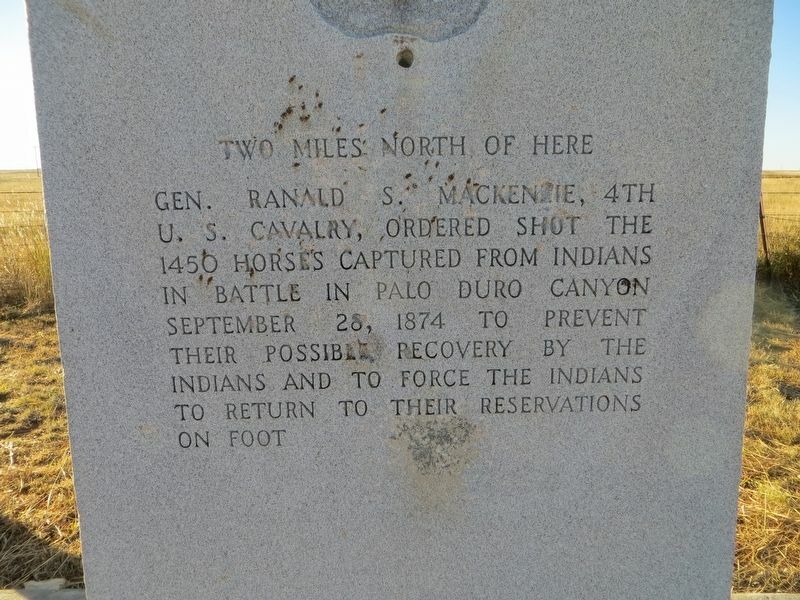 Gen. Ranald S. Mackenzie, 4th U.S. Cavalry, ordered shot the 1450 horses captured from Indians in battle in Palo Duro Canyon, September 28, 1874, to prevent their possible recovery by the Indians and to force the Indians to return to their reservations on foot. Marker series. This marker is included in the Texas 1936 Centennial Markers and Monuments marker series. Location. 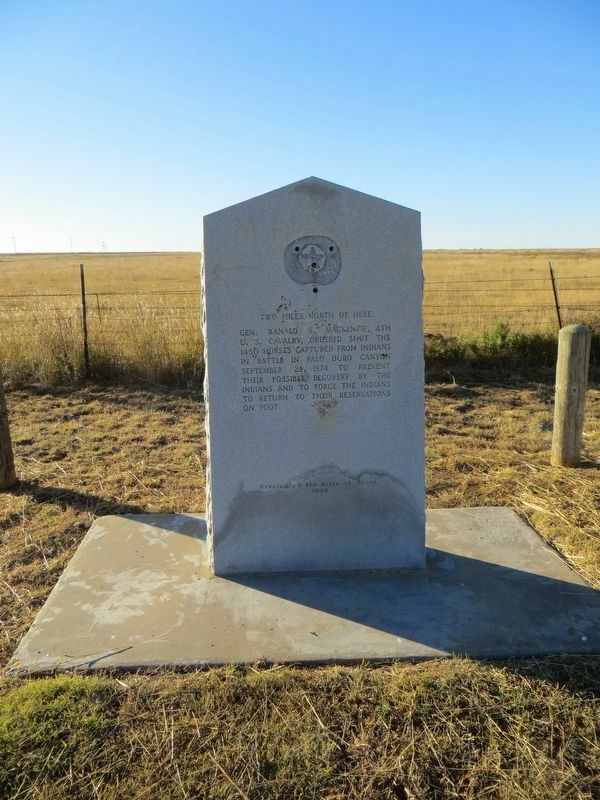 34° 28.608′ N, 101° 32.119′ W. Marker is near Tulia, Texas, in Swisher County. Marker is on State Highway 86 2½ miles east of Farm to Market Road 2301, on the right when traveling east. Touch for map. 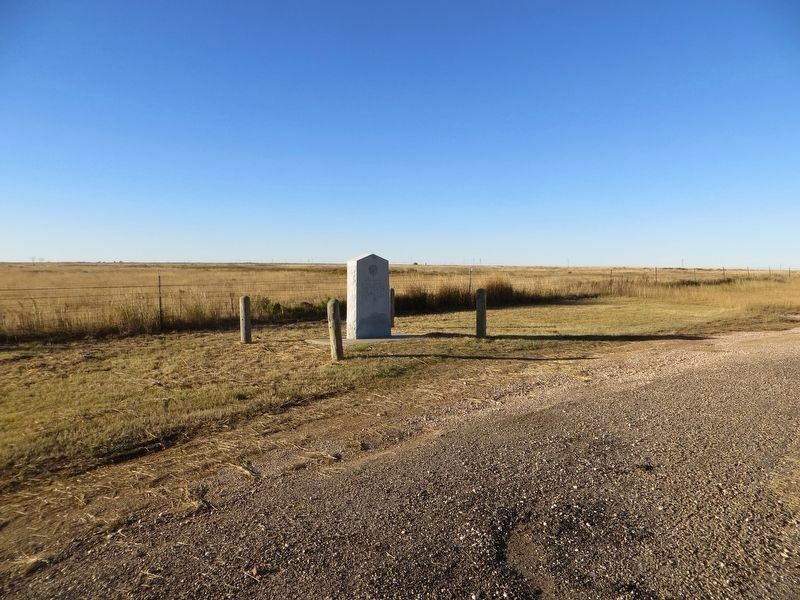 Marker is in this post office area: Tulia TX 79088, United States of America. Touch for directions. First Baptist Church of Claytonville (approx. 7½ miles away); Milo Cemetery (approx. 9.4 miles away); The Vigo Park Methodist Church (approx. 12.3 miles away). More. Search the internet for Palo Duro Canyon. Credits. This page was last revised on November 20, 2016. This page originally submitted on November 20, 2016, by Bill Kirchner of Tucson, Arizona. This page has been viewed 196 times since then and 10 times this year. Photos: 1, 2, 3. submitted on November 20, 2016, by Bill Kirchner of Tucson, Arizona.